Movie Review: G.I. Joe: Retaliation- Though Better Than the First Installment It’s Still an Embarrassing, Clumsy, and Illogical Action Movie | Generation Film! From this moment on if the insignia of “Hasbro” hasn’t been treated as the movie stamp equivalent of the health warning on cigarettes—an idea that is more desirable than the ridiculous rating system we currently have for movies—then it must be recognized as such now after G.I. Joe: Retaliation. “Hasbro” has launched an unhealthy string of brain injuring films from Michael Bay’s chaotic Transformers films to the aneurysm inducing Battleship severely risking our cumulative cinematic health. To be fair to the Jon M. Chu directed unnecessary sequel to the horridly derivative G.I. Joe: Rise of Cobra it isn’t nearly as skin crawlingly awful as the first installment. However, this generous acknowledgment is similar to saying that a stroke would be preferable to cancer despite the fact that they are just different degrees of awfulness. G.I. Joe: Retaliation demonstrates all at once the dullness of lethargic storytelling and the overindulgence of special effects infused action creating an experience that is completely void of feeling and chemistry that is practically essential for memorable action films. It’s especially disappointing to know that writers Paul Wernick and Rhett Reese, who also penned the surprisingly humorous Zombieland, couldn’t bring their sensible and comedic touch to a script that needed more than the standard Hollywood formality. When G.I. Joe: Retaliation gets moving in its kinetic action it simply doesn’t stop for anything including explanation, development, or common sense, but that isn’t uncommon for blockbuster nonsense that satisfies the people who put asses in masses. Breaking everything down we have a dense script that is directed with pure adrenaline by Jon M. Chu and includes a cast of characters that seem embarrassed to the point of numbness. It might not be the worst film that possesses the “Hasbro” label but it certainly is a consistent addition to the lack of quality that insignia resembles. Though “G.I. Joe” originally started off as action figures from “Hasbro” there is plenty of spawned off material in the form of comics and an animated series that could have given both of these G.I. Joe films some credible creative inspiration. Instead of adopting the serious tone of some of the comics or the cartoonish tone of the animated series the film possesses a disjointed mixture of the two giving us awkward moments of humor, a plethora of intense violence, and over the top villainy that would make the antagonists of the Adam West Batman television series blush. What G.I. Joe: Retaliation doesn’t give us is a coherent plot since it’s mostly constructed around messy montages, clumsily explained motives, and the convenient elimination of characters they are tired of, i.e. Duke and Destro to name a few. Screenwriters Paul Wernick and Rhett Reese didn’t bother taking a chance to change the series for the better and instead followed the poorly executed first installment like creative lemmings. Characters are introduced without any real relevance or purpose for the continuation of the plot while the conspiracy at the center of the plot is about as tacky and unoriginal as they come. Two noteworthy aspects of the script are the absence of pulse cannon guns and mech suits that made G.I. Joe: Rise of Cobra so fascinatingly absurd and the use of tungsten rod technology in this film, which is an actual viable space defense weapon. These are practically inconsequential qualities to the film as a whole anyway so what we’re left with is incredibly poor dialogue, non-existent character development, and a movie that makes so little sense that it’s constantly trying to explain what’s going on through messily put together exposition breaks. But these qualities never matter especially in an action movie that was constructed to never stop once it began shooting, exploding, and destroying even itself. People who haven’t heard of director Jon M. Chu just haven’t seen the viable masterpiece work he created with Step Up 2: The Streets and Step Up 3D (even the titles have a certain eloquence that is lost among the simpleminded). This is the type of director you immediately think of when you’re trying to put together a pulse pounding action extravaganza because dancing is the equivalent of people moving like bullets and bombs. All hazing aside Mr. Chu doesn’t do an abhorrent job directing his action sequences that possess a variety of styles and influences that include kung fu, swordplay, hand to hand combat, gun action, and explosions. The real issue with his direction is relating action to character and plot, which is completely absent from the entire frenzied mess of a film that shall forever be known as G.I. Joe: Retaliation or by its subsequent name Step Up, G.I. Joe. The choreographed violence certainly has a confident touch but the technicality without relevance or feeling comes off as soulless. You can only distract your audience with rampaging bullets and frenetic explosions for only so long until they begin noticing the awful pacing, the painful dialogue, and the absolute zero acting chemistry. What really suffers in G.I. Joe: Retaliation is the unconfident choice in tone since it jumps from comic book humorousness to 60s television corniness to military seriousness. Action movies could use a little less seriousness and pretty much adopt a self-mockery tone that would have done the embarrassing dialogue some good. Mr. Chu might not have been the best choice to choreograph an action film but he didn’t botch the film with his talents (or lack thereof) since that was already doomed once he was handed the awful script. And as hard as they try to bring a little charisma to the screen the actors just can’t put life into this soulless, embarrassing, and messy action film. Certainly everyone is aware of the odd retraction of G.I. Joe: Retaliation from a 2012 release due to the fact that Channing Tatum wasn’t involved in the marketing strategy but was added into it after his success with Magic Mike. There’s a darn good reason he wasn’t really involved because he’s not really in the film and perhaps that’s one of the reasons that makes G.I. Joe: Retaliation somewhat preferable to the first installment. 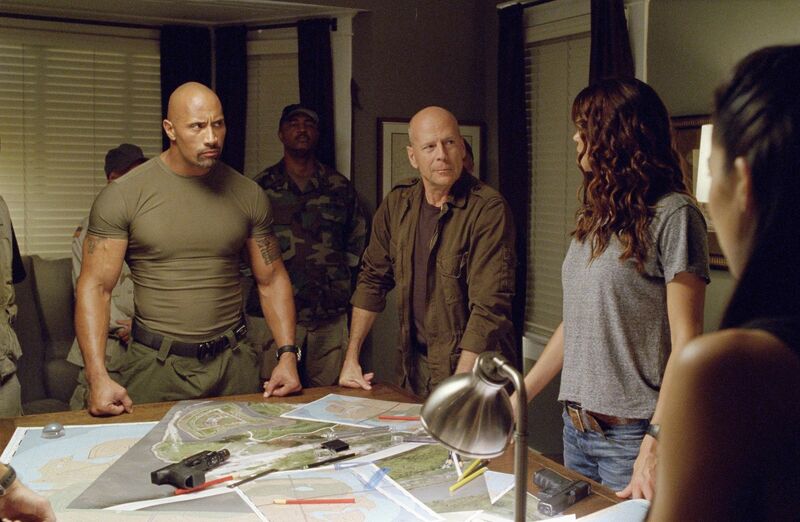 This film is instead a full on Dwayne “The Rock” Johnson action picture and though he has a better presence than most recent action movie stars there wasn’t an ounce of cleverness in his character, his dialogue, or his charm. Blandness in character really doesn’t translate well on the screen especially when your cast is a group of unknowns, pretty faces, and action personalities. Ray Park probably is the most eloquent character on the screen as Snake Eyes and yet he doesn’t say a word throughout the entire film allowing him to be free of the dialogue that tainted everyone else. Some familiar faces including Jonathan Pryce, Walton Goggins, and Ray Stevenson make you cringe that their talents are wasted on such poorly written material while others, such as Rza and Byung-Hun Lee, were perfect for the waste. What was really unfortunate was to see Bruce Willis under-utilized and meander on screen as though he had family being held hostage to force him to do this project. This hasn’t been a good year already for Bruce and the recent trailer for Red 2 isn’t making any promises to make it a better one. The entire cast attempts using all of their superficial talents including their bodies, their forcible charm, or their sexual appeal to make up for the absence of quality storytelling with little to no avail. It wouldn’t have mattered who was cast in this doomed screenplay because it didn’t have the contemplative thought or the kind of well-rounded director to make it anything more than below average. If the criticism came down to whether or not G.I. Joe: Retaliation is better than G.I. Joe: Rise of Cobra then this film might have received some minimal praise for leaving behind some of the more ridiculous qualities in the first installment. However, updating a broken computer’s software doesn’t mean the main component isn’t still broken. Director Jon M. Chu gives the film his all in bringing exciting and diverse action displays throughout the film but nothing can make up for the fact that the script is an absolute embarrassment of writing from a plot standpoint, a character standpoint, and a dialogue standpoint. Despite having written a quality comedic/action film before with Zombieland, it seems screenwriters Paul Wernick and Rhett Reese took the path of least resistance and followed the basic Hollywood formula to construct an even more basic action film. Action junkies will be comfortably numb in their indulgence of explosions, guns, and non-stop adrenaline but really G.I. Joe: Retaliation doesn’t have enough charisma or enough longevity to be anything more than a momentary action film. Considering that “Hasbro” has been responsible for a series of terrible films it’s time to avoid them as though they are a brain altering plague, especially since they’re planning on more unfortunate destructions of our youth from Monopoly to Stretch Armstrong. Knowing that the “Hasbro” insignia will continuously equal lower quality movies will be a start because knowing is just half the battle.